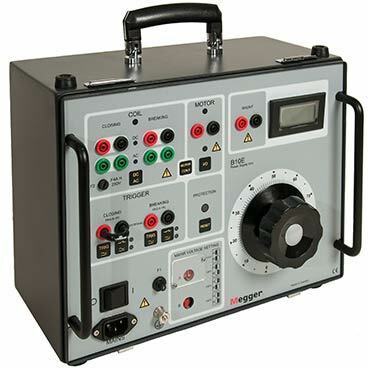 A variable DC voltage is needed to test a circuit breaker. Substation batteries should not be used since this entails considerable risk for testing personnel, testing equipment and also for the equipment being tested. The best way to ascertain whether or not solenoids and protective mechanisms are sluggish or set improperly is to perform a test at minimum tripping voltage. The minimum trip voltage test is described in a number of international and national standards such as IEC 62271-100, ANSI C37.09 etc. B10E d.c. voltage power supply can be used to test breaker coils in this manner. It provides a ripple-free variable DC voltage that can easily accommodate a high, variable load.